When we moved into our new house last year, the attic was full of old doors that had at one point been fixtures in the house. Apparently, the previous owners had an issue with privacy. As in, they cared nothing about it. Although, I'm not 100% certain where all of those doors went because, save the wet bar, nothing that I could see was missing a door. In fact, we took several more off and added them to the collection. I'm certainly not complaining because, as you might have picked up...I like to re-use stuff. And paneled (wood) doors are pretty nice to have laying around. Not bad-looking, but you'd need to build an apron as well for support and to keep the legs straight, which equals more time and more money. 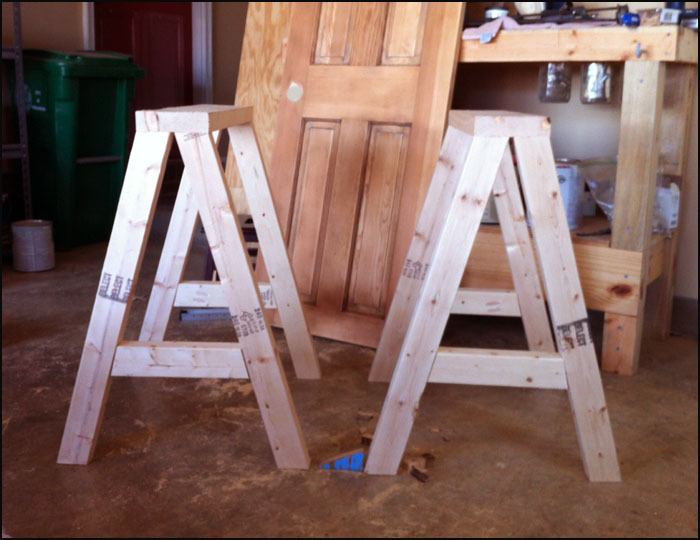 Simply put, sawhorse legs are more forgiving. I cut my legs about 15 degrees off-center, so if you have a miter saw, you know what I mean. If you don't, you probably won't be making this anyway. Now might be a good time to mention that, if you don't have a compound miter saw, you're missing the boat. I use it on every single project. In the left pic, that's how I found it, complete with an oh-so-retro honey finish. Since paint doesn't stick too well to shiny finishes, I used that as an excuse to sand it down so I could darken the base color. 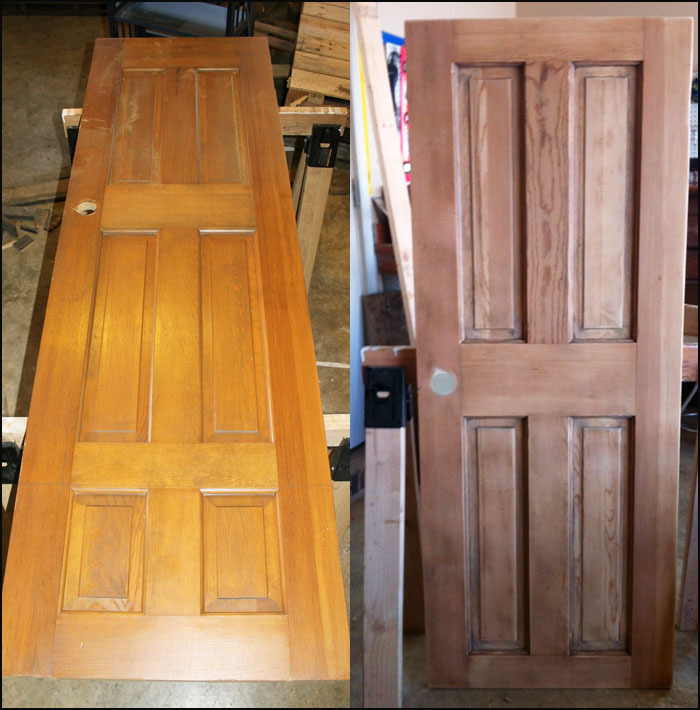 The pic on the right is what it looked like after I filled the door knob hole and sanded it down. 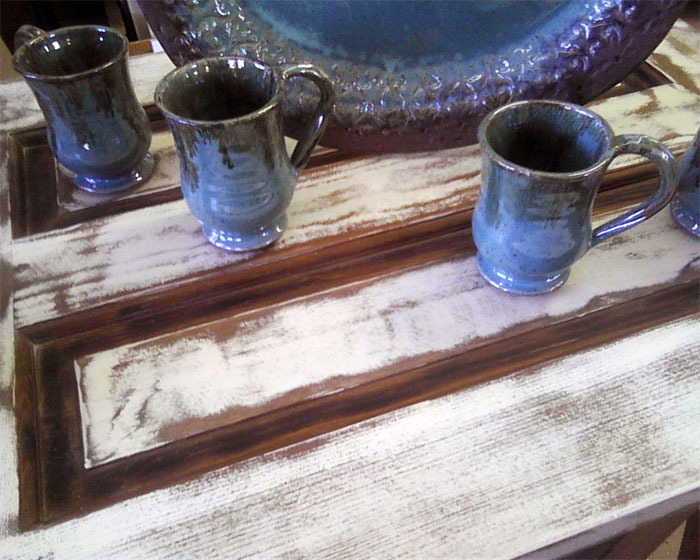 I ended up staining the whole thing with Minwax Early American. Here's where the photo sessions went to crap. Me, to myself: "So, I am at a pivotal transformation point...should I walk inside to get the camera? Nah, that's too much effort, I'll get the next one." "Crap, I'm almost done and havent taken any pictures. Quick - take one of something, anything!" Yeah, and that was apparently all of the photos I took during this entire project build. What you DON'T see is me taking a blowtorch to the panels to create a cool aging effect, the door with stain, the subsequent two coats of antique white paint or the distressing progress of said paint. Really, it was just a massive failure on my part to document this. And unfortunately, you're the victim here. 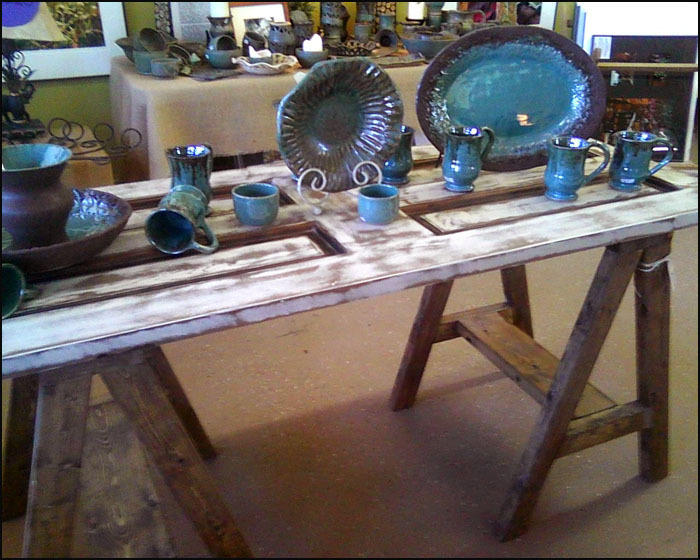 Anyway, here it is at Amity Pottery, displaying some of Melissa's great pottery pieces. Should I even bother to point out that one of my goals when dropping this off at her shop was to take some awesome "after" pics? I brought the camera and everything, then brainfarted my way back out to the car and all the way home. So I had to rely on Melissa to snap some with her phone camera. Sweet. And there are absolutely no pics of my granddaughter in this entire post either. Speaking of my granddaughter, you may one day regret having a blow torch handy in the garage. @Danny - I use a compound miter saw. I just make sure it's resting right against the built in fence, rotate the blade using the miter function to the desired angle (which is easy to read), then start the saw and lower the blade. Practice on scrap pieces to make sure the blade settings are accurate and adjust according to tool manual if needed. Hope that helps! 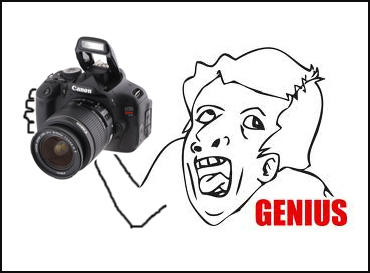 I laughed when I saw the genius meme, LOL! But anyway, a great funny post to teach us something useful! 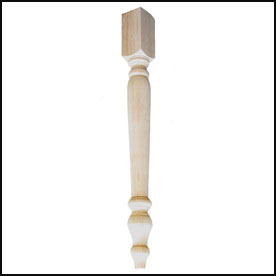 Hi, I appreciate every bit of your efforts to let us know about Paneled Door Table. In fact, we’re going to study and research it as part of a half-yearly initiative supported by our website Sandersreview and group of partners. Hey Gaines, I read the post entirely and couldn’t help thanking you for sharing with us this piece of informative resource. Could you please explain the Paneled door table a little more, so I can enhance the knowledgebase of our community website Drillly. Of course, you can do it in another post! Any effort appreciated!